Malika is an illiterate woman from Herat province. Herat– I have heard a lot about women’s rights in Islam, but I never saw it being practiced by anyone in Afghanistan. The revolution, the Taliban, and some other difficulties caused me to remain illiterate. 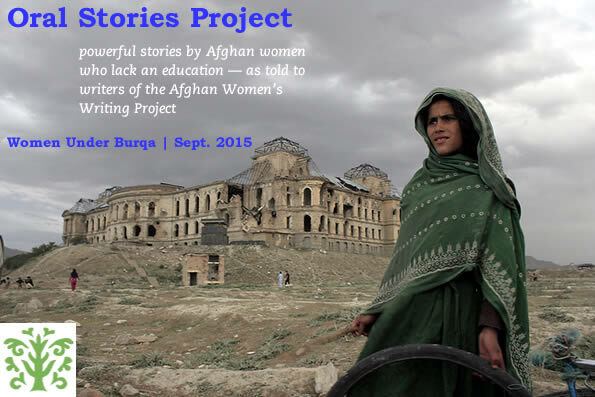 During the Taliban reign, no girls were allowed to attend schools. They destroyed the girls’ schools so that most of the girls and women would remain illiterate. I am not eligible for human rights in my own life. When I go to the bazaar or somewhere else, I wear my burqa. I am allowed to go out alone in my burqa and I feel safer when no one can see me but I can see them. At home I do all the house chores. Almost every Afghan girl does house chores. It is their obligation. We have children, husbands, and in-laws and we have to serve them. This is our job. We do not work outside the house. If I were literate, I would have wanted to work for the government to help our people. I didn’t even have the right to choose my life partner. My family chose my husband for me, but now I am happy with him. I always had a dream to become someone in my life, to serve my people, as a doctor or a teacher or a nurse. In my view a Muslim woman should have the right to work, to study, to go to a masjid religious school, to serve the government and the people of her country. Men and women are equal in Islam, but in Afghanistan they are very different. In rural families when a girl is born, the parents of the child are very sad. For example just a few days ago a baby girl was thrown away on the streets in a small box. She was newly born. These narrow-minded people make me regret being born a girl. My request for the government is to stop these bombings, save our innocent youth, and also create jobs for them. So much of the population is unemployed.